Buck and Blanche shortly after his release from prison. W.D. jones at the time of his arrest. On March 22, 1933, Buck Barrow was granted a full pardon and released from prison. Within days, he and his new bride, Blanche, had set up housekeeping with his brother, Parker and Jones in a temporary hideout in Joplin, Mo. According to family sources, Buck and Blanche were there merely to attempt to persuade Clyde to surrender. Others say Buck was simply up to his old habits, and Blanche was just along for the ride. Their next brush with the law arose from their generally suspicious — and conspicuous — behavior, rather than because their identities had been discovered. Beer had just been relegalized after Prohibition, and the five ran loud, drunken card games late into each night in the quiet neighborhood. "We bought a case of beer a day," Blanche would later recall in her autobiography "My Life With Bonnie & Clyde" published in 2004. The men came and went noisily at all hours, and once a BAR (Browning Automatic Rifle) discharged in the apartment while Clyde was cleaning it. Although the short burst didn’t bring any neighbors directly to the house, at least one registered suspicions with the town police. 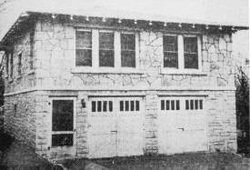 Lawmen, thinking they would merely confront unruly bootleggers, assembled a two-car, five-man force on April 13 and approached the house. They knocked and Blanche, realizing it was the law, noted everyone was asleep and to give them a moment to get dressed. It was all the gang needed. Clyde, Buck and Jones grabbed weapons and opened fire. One lawman was killed instantly and another fatally wounded. Before the other lawmen could react, the gang, except for Blanche, had piled into a car and escaped. Blanche had ran from the apartment in the confusion in pursue of her fleeing dog, Snowball, and she was pulled into the car as it sped away. Although the surviving officers later testified they had fired only 14 rounds in the conflict, they came very close to changing history. It was later learned one of the bullets nicked Jones in the side, one struck Clyde but was deflected by his suitcoat button, and one grazed Buck after it ricocheted off a wall. All three had come very close to being killed that night. 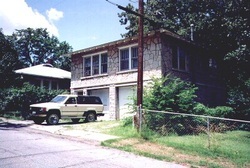 The Joplin hideout as it appeared at the time of the raid. The Joplin hideout as it appears today is pictured at top. Barrow and Jones ham it up for the camera in one of the photos found at the hideout. Below os Barrow and Jones in another hideout photo.